Many of network marketing's top income producers are well documented for using Real Time Local MLM Leads. You may want to have prospects you can meet with face-to-face, invite to local meetings, or take advantage of the inherent trust of speaking to someone locally. Each lead is delivered in real-time! Some people refer to them as live leads or instant leads. 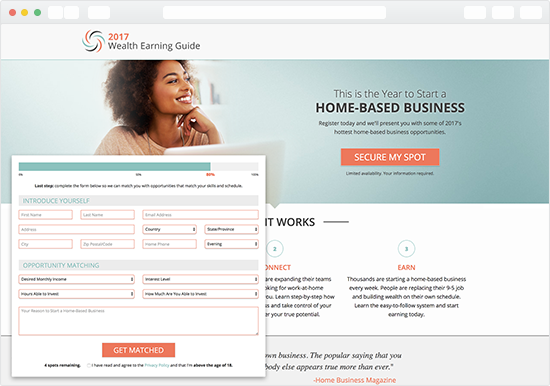 This means that as soon as a prospect completes and submits their information on one of our home business opportunity websites (click on the image to see a sample website), it is immediately emailed to you. Prospects are delivered to you from up to five area codes you wish to target. You can further customize your leads by gender or to send (redirect) the lead to your personal website. To choose these options for your real time local leads, click on the "More Options +" link below. If you are looking for real time leads that are nationwide or just sorted by time zone, choose our real time surveyed leads, and then from the options, choose the time zone you wish.